Hey you!! Its me again, back with an easy and fun hair tutorial! This is another style that was requested a bunch of times through emails and comments after this outfit post, so for those of you that wanted a step-by-step, here you have it!!! This style is a lot like the headband tuck in that you're going to be tucking your hair up and inside, only this time its going to be your own hair you'll be tucking around and not a headband! I love this style because it can look so elegant and chic, while being so fast and effortless to create. Step #1: Begin twisting the hair on our side of your head over itself, continuesly grabbind more hair from underneath and pulling it out and over (like in this post) until you get just past your ear. Repeat on the other side of your head, then combine the two twists into a low ponytail at the back of your head. Step #2: Work your fingers right down the middle of your ponytail, from the middle of your head right down into the middle of your ponytail. Don't go all the way through! You're merely making a little 'pouch' or 'hammock' for the rest of your hair to sit in. 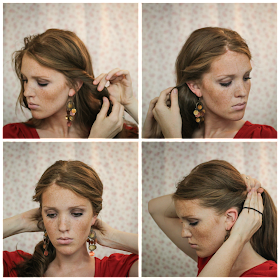 Step #3: Bunch your hair up in your hand and tuck up and inside the little pouch you just made from your ponytail! (If you'd like more volumn in the result, you might want to tease your ponytail a bit before tucking securely inside.) Proceed to pin it in place a half dozen times or so until secure. At this point I tugged my flyaway's out a bit, and took a little chunk of my long bangs and just let it go, but that's totally up to you! Spritz with a bit of hairspray, smooth over a little, and you're all done! Well as always I hope you give it a try, and if you do and it appears somewhere on you blog I'll link up your post right here in this one! Take care and have a positive day! P.S. Stay tuned tomorrow for the announcement of the three winners of the leopard heels! Love this hairstyle :) So easy and cute! Definitely this style is amazing, but i like neymar haircut. Are you know about neymar hairstyle? Neymar hair style is very amazing. Definitely doing this for work :) So simple and so cute! THat's what I love about it! People always ask how I did it, and I explain that its really simple. will be trying this soon! I love it. Really beautiful. I will try too. Looks so elegant yet so easy! Lovely - as always, Emily. :-) Your earrings are pretty! This looks amazing. I'm not sure I can pull it off with my hair, but it looks so pretty on you! Emily thank You for gave me the two websites. I checked, Definitely both stores has the styles of dress that I am looking for. I am very conservative and the two stores that you recomended Anthropologies and Shabby Apple have exactly the style that I want. I love the dresse specially from the Shabby Apple. That store has great prices. Thank You. Absolutely beautiful.. I would love to try it!!! It looks stunning and yet so simple!! I'm following you on GFC and Facebook now! Wow, simple and gorgeous! Would be great for a quick, running-late-for-work hairstyle. (Which happens to me a lot it seems, haha) Will try this tomorrow! ooooh I need to try this... think my hair needs to get a little longer... but definitely pinning this for later! Gorgeous! I will try this, even if I am not good at hair-dos, this seems doable. It looks lovely on you! Love this look and you are so beautiful!! So adorable...I just tried it and it was super easy. Thanks for sharing! Very pretty, and you make it look easy ... well, do-able at least ;) ... for someone like me who has tons of hair and no idea what to do with it! Can't wait to give this a try. A bit different to how I do mine, but I will have to try yours! My tail bone length hair makes some styles a bit difficult, but i like having my hair up to prevent tangles. I'be been trying hare to branch out from ponies and buns! Hey, I love this post.You're beautiful, and you have nice hair too. I love, love, love this hairstyle! Your tutorial is so easy to follow. I can't wait to try it! I'm going to alt too! We should definitely try to meet. Love your blog! 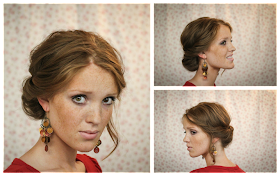 This hairstyle is wonderful, so classy and easy -- and you are really gorgeous, you wear that style like a queen! Beautifull simple & fast ! thanks for this tutorial! I'll going to look at the others! I tried this the other day and I struggled with it! Your instructions were super clear and easy, but my side twists kept coming untwisted when I tried to pull everything back into a ponytail and I just couldn't hide my hair tie no matter how hard I tried! I did try it on straight, product-free hair, so maybe if I curl it and have mousse or something in it first it'll work better? Thank you so much for coming to me! I have a few tips, because That happened to me once with the twists, and I got so frustrated! Curls or waves is a good idea for a softer smoother finished look, and some spritzes of hairspray are definitely how I go about it! I run my fingers through my hair a bit while spraying, to get a little coating without making it all stick together:) Then when I do one twist, I'll pin the end or clip it loosely to hold it in place till I'm ready with the next! does that make sense? Also with the hairtie, siometimes the hair from the base of my neck is to tightly in the ponytail, and to I just have to pull the hair out of the ponytail (carefully) and keep twisting it back to your head to see if that's enough. I'm going to start making videos of my hair tutorials soon to help out a bit more with the instructions, but i Hope in that meantime that all this ranting has helped a bit! Thank you so much for trying my hair tutorials, you made my day! Also feel free to come back with any more questions, but again I hope I've helped!! thank you so much! your tutorial are so-well explained! I've tried this on my hair a few times. It's fairly long and I have trouble getting it all to go in the "pony pouch". I get this really messy looking spot in the middle where I've stuffed all my hair in. Eventually usually it all works out, but I've found it rather frustrating. I'm rather fond of the style... I tried it for the first time getting ready for a date night. Later that evening he proposed! Wow, was that so easy??? I'm gonna try it now! Love how simple, yet elegant this hairstyle is! Thanks for the tutorial, I'm definitely going to try it out tonight when I go out. 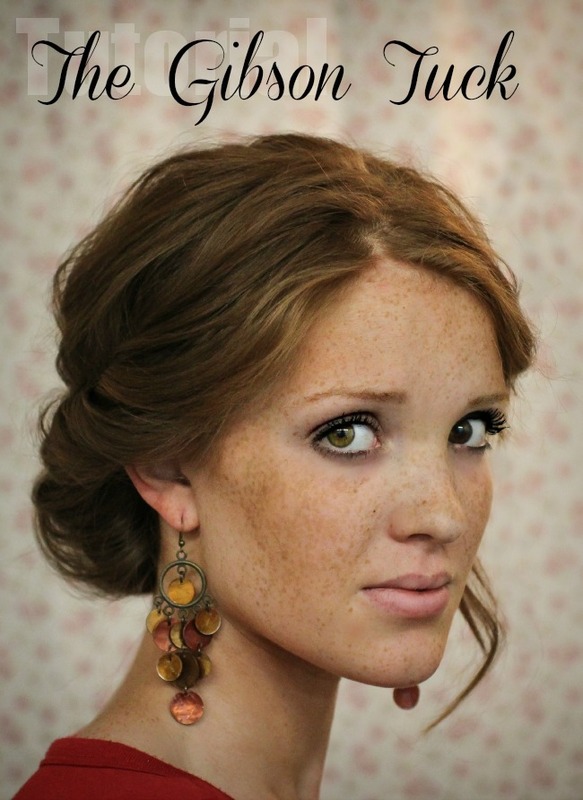 :) By the way, you have the most adorable freckles! I've always wished since I was a kid that I had freckles. If I can make this smooth, this is even a style I can wear in the military! Thank you! Thank you - just tried this pretty much sitting at the computer and its so easy- but perfect for wedding I'm going to! Absolutely love this easy and convenient hair style. Definitely going to try it. Quick & totally off topic question (although I do love the tutorial), but where might one find those earrings? It's almost Christmas and I know a lady who would love them. Thank you! Love this! Do you have any tips for keeping the ponytail in the "pouch"? I've tried several times, and my ponytail keeps poking through the pouch! Thanks! Classic, timeless beauty... the 'do' and you. Thanks for sharing! !